Experience astonishing Greenland, one of the world’s most spectacular wildernesses, aboard Silversea Expeditions’ luxurious Silver Explorer, as she sails through spectacular fjords and iceberg-strewn seas on this 12-day voyage. Departing Reykjavik, Iceland on 15 August 2015, Silver Explorer crosses the Denmark Strait, which connects the Arctic and Atlantic oceans, before cruising through the enchanting Skoldungen Fjord, where humpback whales and orcas frequent. Guests will then sail to the placid waters of the dramatic waterfall-surrounded Prince Christian Sound. 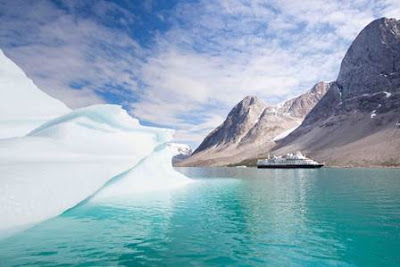 Sailing along the breathtaking western coastline, Silver Explorer ports in numerous picturesque and remote harbour towns including Nanortalik, Qaqortoq and Hvalsey, where guests will uncover the many wonders of Greenland, including its fascinating Viking history and unique Inuit culture. Silver Explorer continues her adventure to Nuuk, Sisimiut and Ilulissat. Here, guests can witness the Ilulissat Icefjord, a UNESCO World Heritage Site, see the famous Qilakitsoq mummies or take an optional helicopter excursion over the magnificent Icefjord. This voyage concludes in Kangerlussuaq, Greenland, with guests disembarking on 27 August 2015. Book this Silversea Expeditions voyage by 30 June 2015 and select a two-category suite upgrade or 50% savings on a second suite. Prices are per person starting from AU$11,550 in an Adventurer Suite based on double occupancy. Silversea Expeditions’ fares include: all shore and Zodiac excursions hosted by an expedition leader; all-suite accommodation with butler service; gourmet meals with menus inspired by Relais & Châteaux; complimentary wines, Champagne and spirits served throughout the ships; an outstanding expedition team of expert guides and lecturers; and all gratuities.